"we drove out to stonehenge, and took a few walks around it. ive seen it, but i still love it and wish theyd let us touch it. after that we took a drive over to salisbury where we had lunch, and in our little cliques case, shopped. i got a new charm for my necklace. 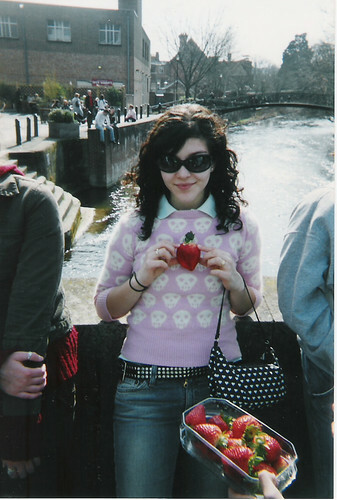 then we walked around and megan and i stood around and smoked cigarettes and bought apples and strawberries instead of lunch." 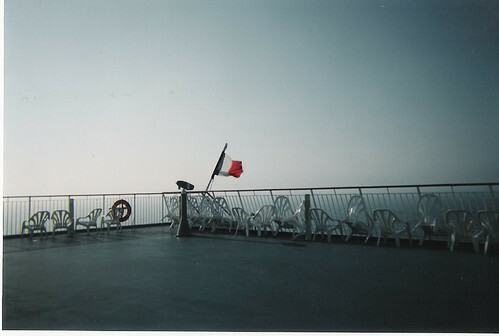 "so we go into the private lounge facing the front of the boat, and find a stairwell to an outside door. we ran away and sam checked with security and we got the a ok to go out. chuck opened the huge water lock door for us and we headed out to the top. it was windy and i thought i would blow away. so sam climbs up on the railing and is just hanging out in the wind. and chuck and i are like WHOA! so we run and get mike and jeremy and kim and show them, and i try it. 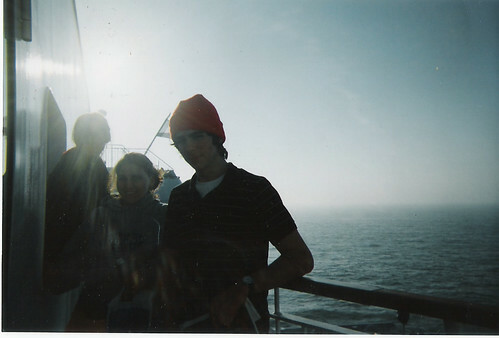 i stood on the railing with sam and kim and it was amazing." "we woke up to a lovely raining easter sunday. we head down to the lobby after dressing up for the holiday to a GREAT breakfast, as are to be expected in france. we ate and then had some more time to get ready before we had to be in the common room for sunday services, where we recited the lords prayer in french which i remembered the WHOLE thing (i can barely do it in english). then onto our shamrock green bus with our crazy belgian driver and off to the beaches at normandy." 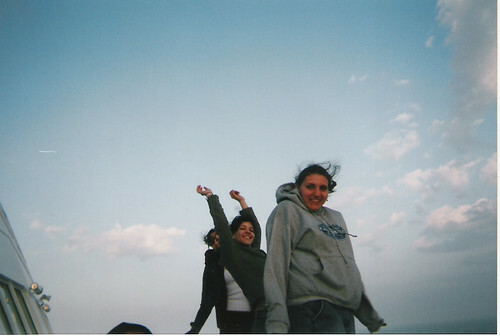 "...i was somewhat speechless and needed a little alone time, so we walked along the cliffs, and went by myself. 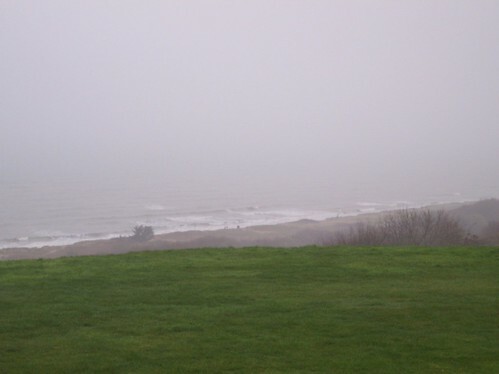 it was really quite suiting weather, all the mist and rain. 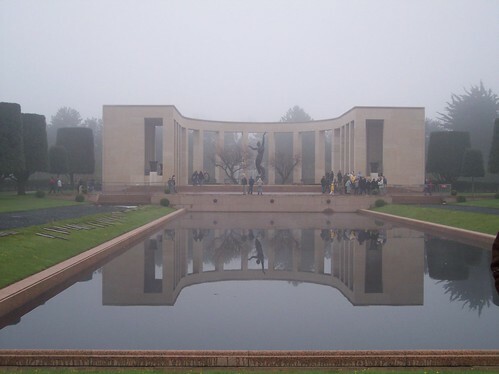 we got back on the bus and drove off for the cemetary at omaha beach where 4,000 us soldiers were buried. i was silent for the most part as was most of our entire tour group. there were crosses and stars of david everywhere you looked. 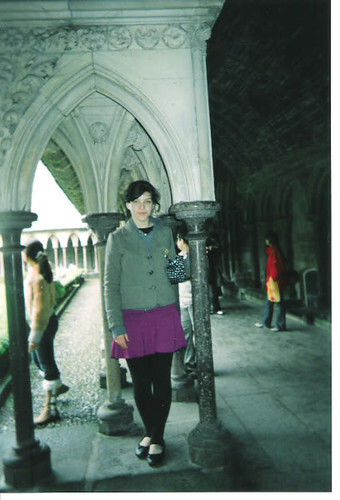 it was a nice spot, and there were beautiful memorials on the cliffs and it was raining which was obviously fitting. 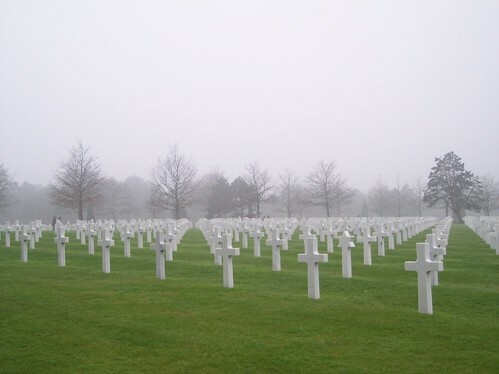 i saw a man crying after putting flowers on a grave, it was so sad beacause if you think about it most of the soldiers buried couldnt ahve been too much older than me if not my age." 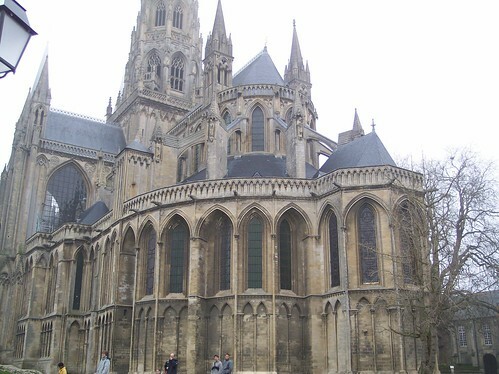 "...we were late to meet up with everyone in front of the cathedral but alot of other people are late too. 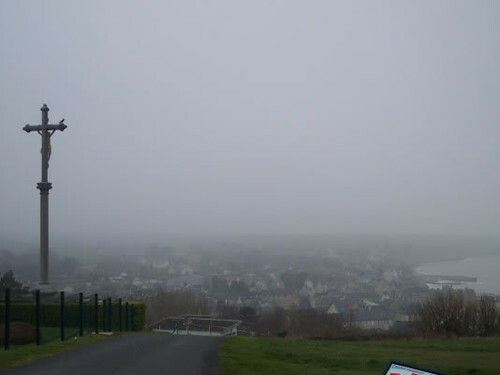 so we take some pictures of the quaintest town ever and head out to Mont Saint Michel. 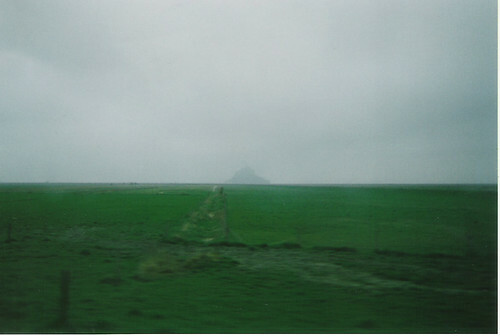 the ride was very long, but we all slept..."
"...its [Mont St. Michel} an island 2 times a day when the tide is high but then its also a huge rock with a town built into it and a medieval castle/cathedral built into its rock." "finally we reached the steep steps leading up into the church and when the whole group made it we went inside. it was cold and damp and eveyrthing you expect from a medieval castle. there were pavillions from which you could see the entire area..."
I never really talked about how I was feeling in those two days 5 years ago. I never really bought the whole God thing. When I was little I believed it wholeheartedly (one of my first clear memories is my mom explaining God to me with a Lou Reed poster behind her and I've always associated the face of God with Lou Reed...). As I got older it made less and less sense. Until those two days. 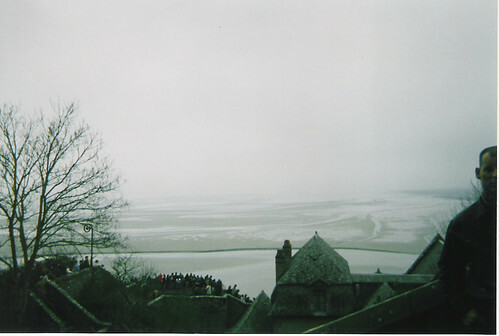 For some reason that Easter service and weekend resonated with me, and the feeling I got in Mont St. Michel especially made me believe that God is a possibility. 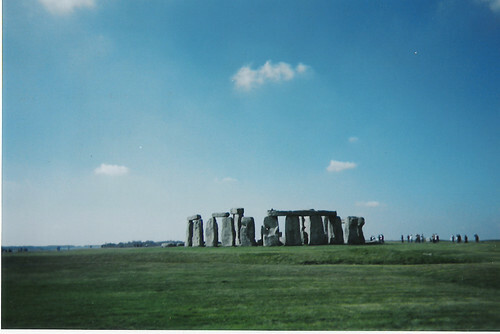 aNd oF couRSe u BeaUTiFuL SiSteR..
Omg, I wanna visit Stonehenge so bad! I hope to go there this summer! These pictures are so beautiful, I want to go SO BAD! I am glad that you shared this with everyone, it looks like it was an amazing trip! These pictures are amazing! I envy u! This was such a beautiful post....both in the photos and your writing. I really enjoyed reading it! Great post! Happy Easter! Your blog is full of lovely inspirations. Glad I found you!